This morning, I decided to just ignore all the little doubts and questions that were plaguing my mind and causing the mental clutter yesterday. I simply got to work. Since it is Bead Table Wednesday, I'll share what I worked on! I started by pulling out the small, but fun selection of beads I picked up at Michael's yesterday with this 20% off your entire purchase coupon. Then, two of the big jars of buttons came out. 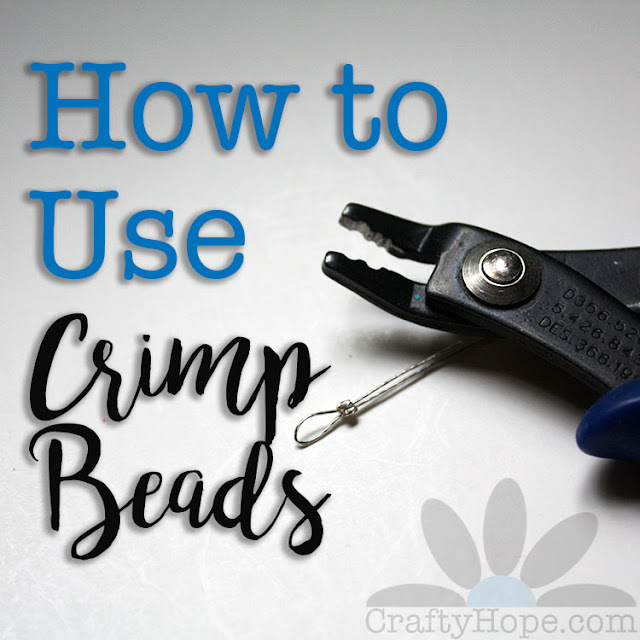 I dug through them to try to find just the right button to use as a closure on a bracelet. Can you guess which one I ended up using?? Well. . .can you? 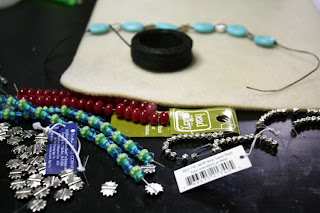 Check out more over at the Bead Table Wednesday Flickr Group. As far as the moodiness of yesterday. Well, I think it was simply caused by my want to succeed in this jewelry game, but not really having a sense of direction. I'm aware of several paths I can take as well as some other alternative routes and resources I can use, but how to find the additional time to cram in those pursuits? For now, I think the main path I'll start down is trying to get into a magazine. Of course, there's a ton of info I want to gather and compile for that first so. . .GAH! Fortunately, as I was going through my feed reader yesterday I came across a post by Shannon over at For My Sweet Daughter and then a post by Erin at Treasure's Found :: Inspiration is Everywhere that really gave me a more positive outlook and a bit more confidence to trudge my way forward. EESH!!! 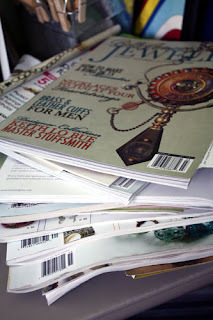 No promises, but I have pulled out this stack of my favorite jewelry magazines and am going to take some notes. I've also already found many of their submission guidelines and realize that I need to get to work IN A HURRY! Enough with the stressing. 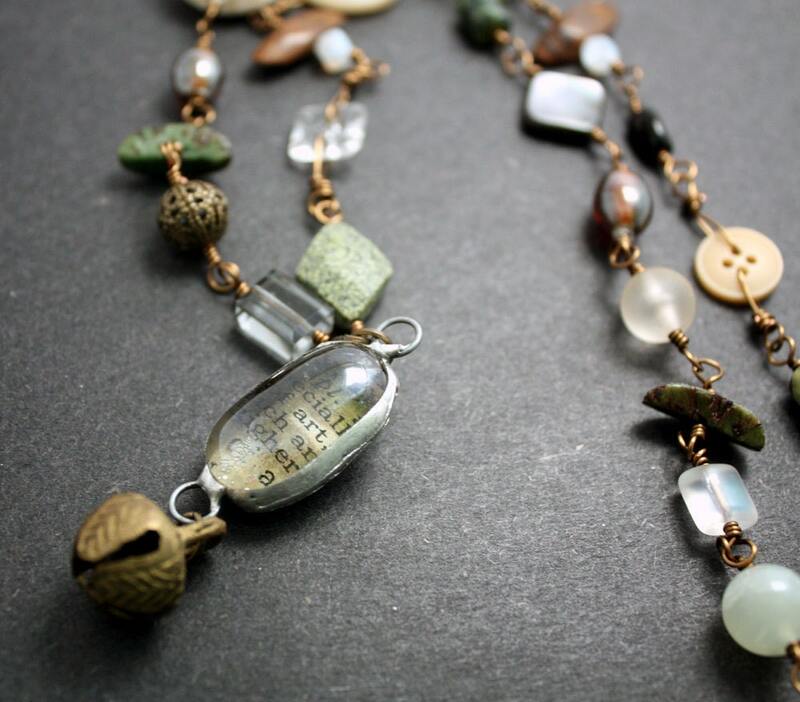 I'm going to take some deep calming breaths while you take a look at the newest necklace in the shop. It's a bit more general, concentrating on the craft magazines as a whole, not just beading. Thank you for the best wishes and thanks even more so for the link to your article. The more advice I can find, the better!! Thanks for stopping by!! Good luck - I also am on the path to wanting to "succeed in this jewelry game"
Emma, That's the one I ALMOST used....until I noticed it had some kind of maker's mark on it and I didn't want to use it until I can bet some research done on it first. Michael's was a good trip, but I was disappointed that NONE of the jewelry supplies were on sale. Figures! Thanks! Cindy, I'm so glad you enjoyed the post as well as the others!! Best of luck to you also! Thanks for stopping by! Hope, I'm glad the clouds have lifted and the sun is shinning on your mood and you are moving forward. I'm guessing you used the very top button with the faint sun or star shape stamped on it. I'm going to Michael's and Hobby Lobby tomorrow it's one of my off days so I can take my time and shop. Best wishes to you on submitting to the magazines. Hope, you are not alone- I totally understand where you are coming from! It's so easy to get overwhelmed and feel "lost"- but all of your hard work will pay off- and I can see your jewelry getting better and better! That Southern Fall necklace is a beauty!! Good luck with the magazine submissions, and don't give up!! Therese, As far as the button I used. The one you picked was the one I intended to use, but on inspection I found that it had some sort of maker's mark/engraving on the back and want to do some research before I use it. Plus, It was fairly heavy and I knew it would turn the bracelet. Instead I used the one just below it. I kinda liked the blue tone to the metal and the lightweight of it! I hope you have fun at the craft stores!! Thanks for the well well wishes!! Erin, I'm glad you can see a change in my work. 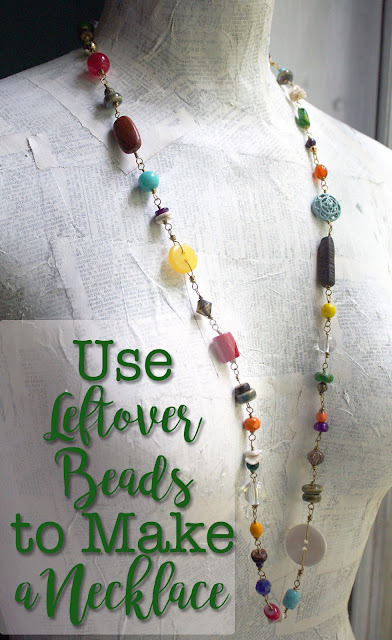 I'm really working to make items that I love. . .as those are the ones that tend to get the most attention - like the Southern Fall necklace. I just LOVE that one and had a hard decision about whether to list it or not. Thank you. Now to just find that starting spot and move forward!